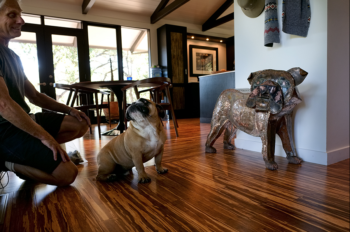 Animal imagery has been used by artists throughout history to communicate important connections between humans and nature. There is a direct connection between humans, all other living things and the mystery of the universe that most people cannot deny. I make these sculptures because I, myself do not deny them. My work is designed to be installed outdoors or in. 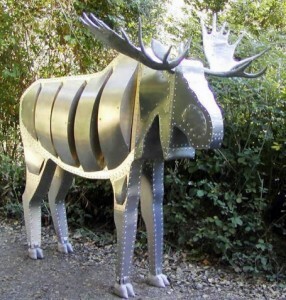 The animals are constructed of aluminum or copper sheet fastened with solid and blind rivets. There is no welding. Parts of the animals (ears, nose, tail, horn, etc.) are cast of solid copper or aluminum. Humans are territorial creatures with a strong need for self-preservation. We are also storytellers and historians who map and catalogue geographic, political, and real estate boundaries. The fact that maps tell only a temporarily tale is what makes them most interesting to me. 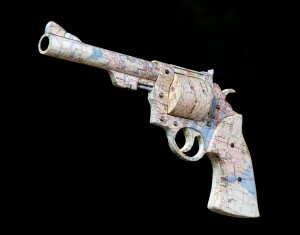 The guns I make are covered with paper maps (vintage and contemporary) and these maps reflect something of the time, place and purpose of the gun. The connections between the map and the gun range from geography alone to the civilizations, tribes and populations that were destroyed by that particular weapon. The sculptures are made of aluminum sheet and rods, rivets, screws, and paper. They are non-functioning and include rifles, semi automatic guns, and pistols. relationships. 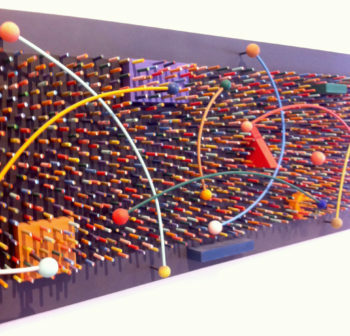 As you walk around these pieces, various optical effects occur and the pieces seem to shift as the colors change. 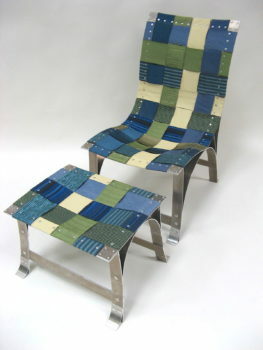 Furniture grew out of my interest in working with different materials and how to fasten them.